Every summer needs a soundtrack that, when rediscovered years later, is able to capture the imagination and transport you back to those hot nights of a hazy August long ago. Indie-pop duo Summer Camp will make a welcome addition to this years playlist, creating cool and creative tunes that will leave you wondering why you haven’t heard of them before. 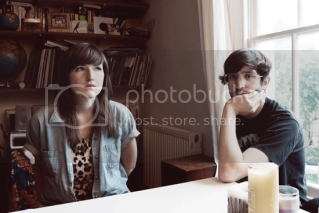 The band consists of Jeremy Warmsley and Elizabeth Sankey, both of whom have previously settled in the music industry, Jeremy as a solo artist and Elizabeth as a journalist. Having met in London, the starry-eyed couple talked quite trivially of creating a band, posting a few songs to their myspace yet totally unaware of the hype that would later build up around them. Their EP, ‘Young’, is available to download from itunes, the particularly memorable highlights including ‘Ghost Train’ and ‘Round The Moon’. The debut album will be available to buy later in the year. NICE! Thanks for posting this. I am always looking for indie pop music! What catch songs... :) Can't wait to buy an album.. keep us posted, please!